After 16 years, Mark Taylor revealed the reason that forced him to take a decision overnight. Australia, led by Mark Taylor made a great start on their tour of Pakistan having not won a Test series ever since 1959 there. They had even failed to win a Test in their last 14 tries. The streak finally came to an end in the first Test in Rawalpindi, where the Aussies defeated Pakistan by a thumping margin of innings and 99 runs. The hosts were bundled out for 269 and 145 respectively with Stuart MacGill taking nine wickets in the game for the visiting who made 513 in their only innings. Australia continued to bat out Pakistan in the second game too as they made 224/1 in the 69 overs of play possible on the opening day in Peshawar. Skipper Taylor put on a 279-run partnership with Justin Langer on his way through a marathon knock. Taylor was presented a couple of chances by Saeed Anwar who dropped him twice off Mushtaq Ahmed when on 18 and 27. At Tea on the second day, Taylor was batting on 253 with his team making 458/4 in 135 overs. 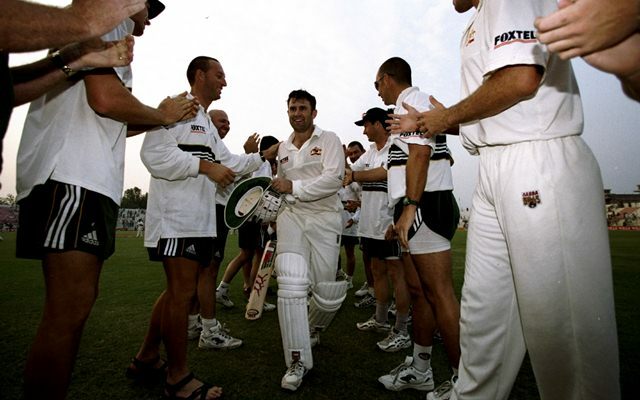 The Australian captain had a perfect chance to go past Don Bradman’s 334 which was the then highest individual Test score for Australia and also Brian Lara’s 375; the then all-time highest Test score. Taylor was once again revived when on 325. He got to the magical number of 334 on the penultimate ball of the second day’s play. He went unbeaten on 334 at stumps along with Ricky Ponting (76*) as their 168-run stand had taken Australia’s total to 599/4. 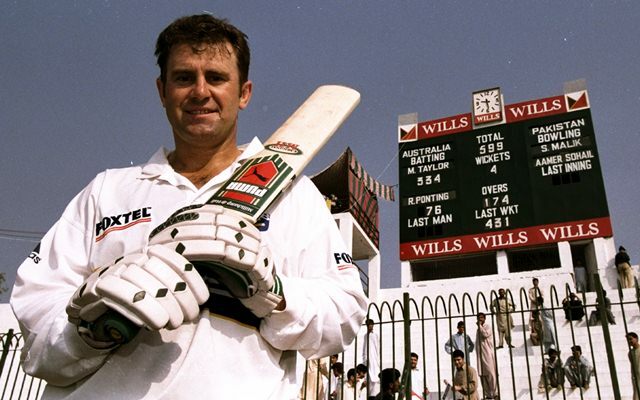 After the day’s play, Mark Taylor said that he would take a decision along with his team on whether to bat on the 3rd day morning. The Australian team decided that he should bat on the following day but the skipper decided against it. “I have equalled Sir Donald Bradman’s record and that is more than satisfying for me. The [Brian Lara] record doesn’t mean anything. I’d prefer to win this game, that’s what I’m here for,” he said after the third day. In a statement, Sir Donald Bradman congratulated Mark on equaling him. Unfortunately, due to illness, Bradman couldn’t watch the innings but released a statement through a spokesperson which stated: “I want to congratulate Mark Taylor on his achievement. I wish him the very best of luck.” Both the Australian cricketers met a month later in Adelaide at Bradman’s residence. After 16 years, Taylor revealed the reason that forced him to take a decision overnight of not batting the next morning. According to the then Australian skipper, he slept at 2’o clock in the morning thinking about the outside response. “I think ideally I would have batted on for 20 minutes just to put their openers out in the field for 20 more minutes before we declared,” he said in 2014 while talking to cricket.com.au. “But I thought if I did that I would then end up on 340 not out or something like that and I think people would have assumed that I’d batted on just for my own glory,” he added. This decision hardly made a difference to the game as Pakistan batted for the next two days to post 580/9 before declaring their innings 19 runs short of Australia’s total. Ijaz Ahmed (155) and Saeed Anwar (126) scored centuries to reduce the scoreboard pressure. Hosts declared their innings to make Australia bat five overs before the close of the 4th day. Australia made 289/5 in their second innings before the game ended in a draw. Mark top-scored for the Aussies once again with 92 before he was bowled by Pakistan captain Aamer Sohail. The Australians won the Test series as the final Test match in Karachi ended in a draw as the home team finished with 262/5 in the 419-run chase. Australia later whitewashed them in the three-match ODI series.